Ryan Dimit, OD was born and raised in nearby Dayton, NV. He attended the University of Nevada, Reno before receiving his Bachelor of Science degree in Vision Science from Pacific University in Forest Grove, Oregon. He then went on to complete his Doctorate of Optometry at Pacific University. During his time at Pacific he made multiple humanitarian trips to Guatemala and Honduras to provide care to native populations without access to healthcare. He was also a member of the Beta Sigma Honor Society. After graduation he completed a one-year Fellowship in Cornea and Contact Lens at the University of Houston. After completing the fellowship, he joined the faculty at the University of Houston, College of Optometry. He spent two years as a faculty member educating students and conducting research in contact lenses. 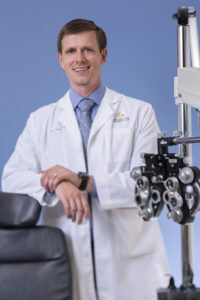 After leaving the University of Houston, he spent 5 years at the prestigious Baylor College of Medicine where he treated complex anterior segment conditions. Dr. Dimit enjoys numerous outdoor activities and can be found on the weekends riding his motorcycle. He is married and has one young daughter. He looks forward to using his extensive clinical knowledge to carry on the tradition of excellent care for the patients of Nevada Eye Consultants.